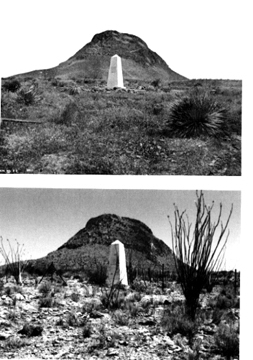 Dr. Robert R. Humphrey's Photos: change 1890-1985 of grasslands to desert by grazing, from his book "90 Years and 535 Miles: Vegetation Changes Along the Mexican Border"
Copyright © 1987 published by the University of New Mexico Press, photos and texts used with permission. Left above: Monument No. 35 - Chihuahuan Desert. "The vegetation here has changed drastically during the last ninety-two years. What formerly appears to have been essentially a pure stand of tobosagrass [Hilaria mutica] has now become an open mixture of creosotebush and snakeweed, with no grass." Right above: Monument No. 82 - Chihuahuan Desert. "The ninety years that have elapsed since 1893 have shown a shift from grasses with a very few scattered shrubs to shrubs and and halfshrubs with no grasses." Left above: Monument No. 112 - Semidesert Grassland. "This area, which I have designated semidesert grassland, is rapidly being taken over by velvet mesquite and might, perhaps, be more properly classified as savanna. An occasional Emory oak lends variety to the mesquite. The oaks are probably about as abundant as they were in the 1890's; the mesquite, in contrast, presents a marked life-form change. What was essentially open grassland has now become a mesquite-grass savanna in which the mesquites are assuming an ever-increasing greater control. " Right above: Monument No. 138 - Semidesert Grassland, Sonoran Savanna. "There has been a major vegetational change throughout this area during the last ninety years, a change evidenced primarily by the invasion of mesquite, cacti, and other shrubs and halfshrubs. 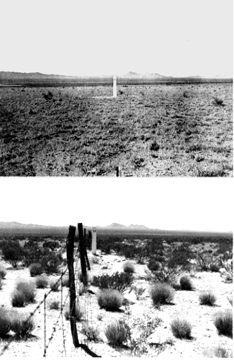 At the time the monuments were erected, this was open grassland free of scrub vegetation and with mesquite restricted to the occasional drainage. When I first passed through here as a graduate student in 1930, it was still essentially open, rolling prairie grassland." 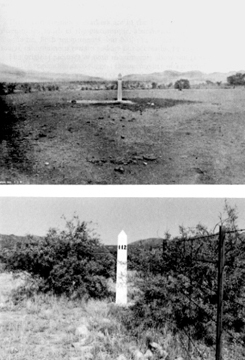 Left above: Monument 144 - Sonoran desert: "The former open grassland, free of scrub vegetation except for the long, dark streak in the background indicating a wash or drainage, has been replaced by scrub. " 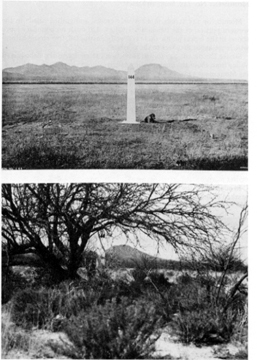 Right above: Monument 157 - Sonoran desert: "Here, as elsewhere generally in the Great Plain, a once open area has been taken over by scrub. Low-growing shrubs, probably saltbush or burroweed, show in the original picture, with a good carpet of what appears to be grasses or a mixture of grasses and annual forbs. 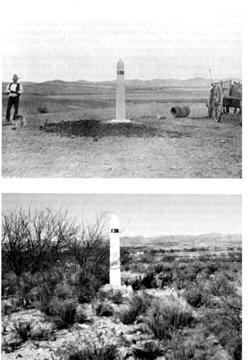 Although two lines of darker vegetation that may have been mesquite show in the distant background, there was none evident in the vicinity of the monument. 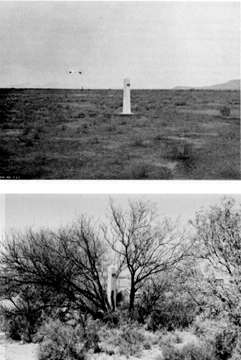 Today, mesquite has become established throughout the area, and I even had to chop away part of one tree to photograph the monument from near the original camera location."